July 30, 2010 Dan O. Do people really compete like this for grocery store managing? Hoping to buy a house, grocery store assistant manager Doug (Seann William Scott) applies for a manager position at his chain’s new location. Doug feels confident about getting hired until recent arrival Richard (John C. Reilly) applies for the same job. 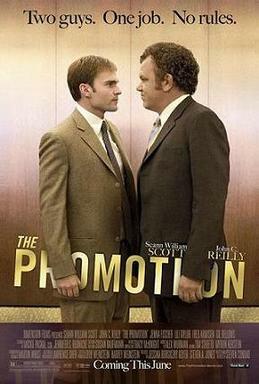 In order to secure the coveted promotion, the competing employees go head-to-head in minor battles, often resorting to cruel behavior. This film I barely even heard about when it first came out, and now I can see why. The comedy is not what these two comedy greats are known for. Usually both are in dumb, raunchy, and sometimes just goofy comedy, that results in random rambling, and quoting for the rest of our lives. This is not like that style of comedy. If anything, it’s just weird comedy. And it soon starts to become a little depressing, because both of these guys just set out so hard to beat out the other one. For the bulk of this film you feel like you have been here before. And you wind up waiting for it to move into original territory – but it never does. The Promotion doesn’t have as much comedy as I expected and not nearly enough drama to fill the gap. And as such, it never quite connects with its audience. You will find the same premise in movies like Employee of the Month – the only difference is that this one is just a little more serious. Seann William Scott is funny, and plays a different character than from what he would usually play, but he isn’t as hilarious as I was expecting. Although, it was weird how I could believe him as this straight-laced, serious super-market co-manager. 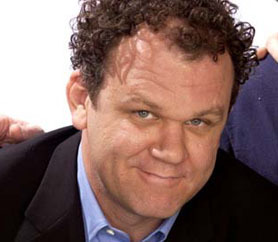 John C. Reilly won my heart in the end, and although the film kind of lets his character down by the last act, but he still had a lot of heart within his character, that made him a bit more likable. Consensus: The cast may be game, but The Promotion starts off original, then falls into cheap and forced laughs, backed by some disturbing moments by the end of the film. You just described the reason why I enjoyed “The Promotion.” 1) Scott and Reilly took a risk in starring in something outside of their comfort zones. 2) The way the picture’s mood constantly evolved and redefining our expectations about what type of a comedy it was trying to be. It’s not for everyone but I thought it was smart and sometimes insightful about the dynamics of two (desperate) men trying to compete against each other. I just thought that the film showed these character’s in such a negative way sometimes, that I couldn’t stay in touch with it. Haha oh your just such a nut Adam.